Compact & bijou eh!?... the main section in the middle features the filter controls. Either side of that is the main control elements for the selected 'Instrument'... things like main-pitch, start time to velocity, pitch to velocity, glide, level to velocity & LFO1 & LFO2 to wheel. So .. 'Instruments' ?... This'd be a good time to explain the hierarchy of the sampler. Ok... remember this sampler can be opened in either MONO or STEREO mode, and primarily it's designed to either do drums and other individual samples multi-mapped across the keyboard, or to load up a sample set to get stuff like piano's and strings and other 'playable' realistic instruments. 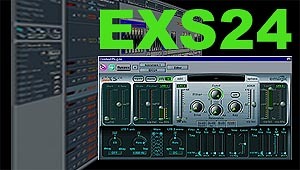 Each EXS24 Sampler instrument is fixed to one midi channel, which is whatever channel the track is set to that the EXS24 is assigned to on the arrange page. 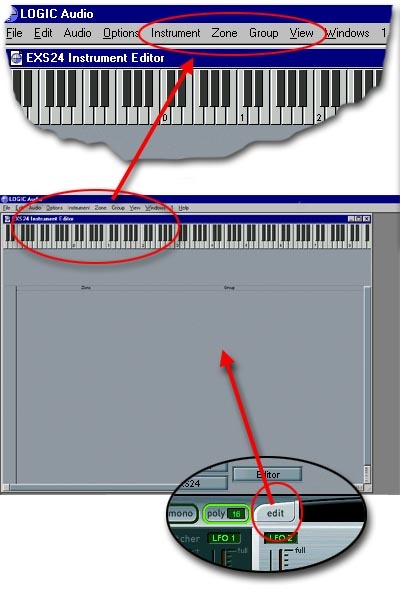 So you need to open a new sampler instrument for each channel you intend to use. This isn't as bad as it sounds actually because opening multiple versions seems to offer no additional loading on the cpu. I've had 8 EXS24's open on a P3 450 without a murmer... obviously the samples you then load to those samplers are stored in system ram, so if you load 8 high quality akai sampled piano's then no doubt cpu stress will ensue on weaker boxes with not enuff ram, but for most practical purposes we dont use the samplers like that. 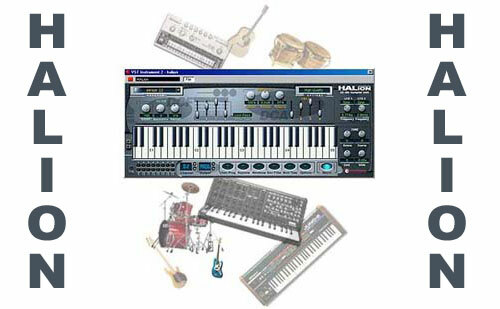 In a typical hardware sampler which does allow different instruments or programmes to be assigned to different channels, we might have one or two 6 octave multi-sampled sounds such as piano... we might allocated another programme to drums; perhaps 20 or more drum samples, mebbe a brass or pizz strings or other programme mapped over just 2 or 4 octaves, etc etc... So all we do is open a new sampler for each programme (Instrument in 'EXS24-Speak') we require... and EXS24 works really well in this way and is in fact easier for that, because each midi channel is a separate sampler it's so easy to work and there is less confusing menu's etc. 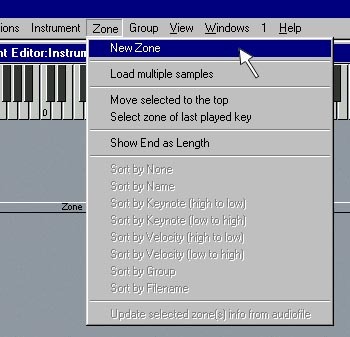 ZONES = Within each Instrument is the ZONES... For every individual sample added to the Instrument (keyboard-map), each creates a ZONE; or you create a new ZONE and add a sample... whatever, but it is a ZONE per sample...Each ZONE contains all the data for the sample. Root note, Pitch, start & end point, loop on/off, one-shot select, mapping range over the key/s etc etc... So to organize the ZONES... they can be placed into GROUPS. 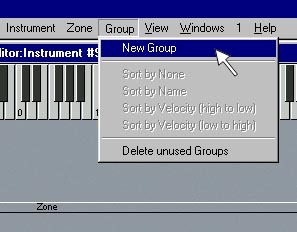 GROUPS = are an easy way to cluster ZONES (samples with their mappings etc) into easy to manage ..er.. GROUPS! 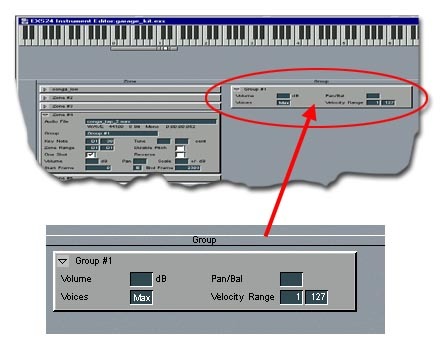 - GROUP's of ZONES/samples can then be adjusted for Volume, Voices (polyphony), pan & velocity range. 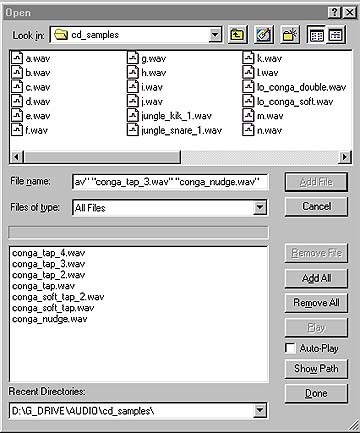 So for example, if creating a drumkit all in one Instrument/sampler where stereo outs is ok, you can assign say 8 percussion conga samples into a GROUP called 'Conga', and your toms into a GROUP called 'Toms', etc etc, easily setting each GROUPS' overall basic parameters in the GROUP panel.. (more on that later). Ok we open our sampler in the INSERT of any INSTRUMENT mixer channel. First we need to create a new 'Instrument'. So we click the EDIT button.... You'll notice when you do so, that not only does the large EDIT screen open with a keyboard across the top, but also 4 new menu's appear whenever the sampler edit is selected. The Title in the EDIT screen changes to 'Instrument X', ('X' being the current instrument number you are at cos EXS24 remembers them sequentially & by name for quick loading). 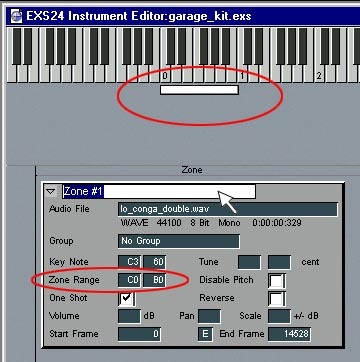 OK, when we've created a default empty blank ZONE, it defaults to the full keyboard map for high & low note... and you'll see the ZONE RANGE bar appear in white under the keyboard image stretching from C-2 to G8 right across the whole keyboard.... You'll see that this relates to the 'Zone Range' boxes on the ZONE panel... Click and drag up/down in either of the ZONE RANGE boxes and watch in wonder as the little white ZONE RANGE bar under the keyboard adjusts to match... this makes selecting upper and lower sample 'Zone Range' keys so easy, just click and drag watching the little ZONE RANGE bar... it's a doddle compared to faffing about with an LCD screen !! Ok... so click as indicated to load a sample to this ZONE.... and this sample select browser opens... find your sample and click ok !... the sample loads into the 'AUDIO-FILE' slot on the ZONE panel. Notice how I've set the ZONE-RANGE to C0 (lowest note) and B0 (highest note) and accordingly the white ZONE RANGE bar has shortened to cover the assigned ZONE (note) Range... magic! Ok... to add more samples to the INSTRUMENT we simply repeat those steps; adding new ZONES, titling them, adding samples and setting the ZONE ranges as you go to complete your INSTRUMENT !! This select box appears, devided into two halves; the upper section is the drive you are browsing, and you can move around your hard drives & network drives etc, selecting samples and clicking 'ADD' to add them to the lower list. When all the samples you need are selected and have been ADDED into the lower screen, click: DONE - and this options box appears asking you HOW to open the selected samples into the INSTRUMENT. 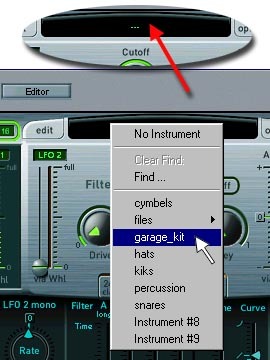 Choose the first two options if your samples are from a library disk with added Key-Note information the sampler can read. 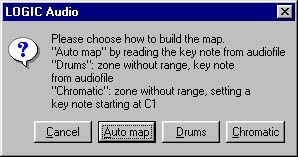 Otherwise the best option is to use CROMATIC for drums and other samples where you want a 'sample per key' basis... (changing ZONE RANGE is easy to do afterwards anyways). Ok... I've selected a bunch of percussion samples and opted to open them as 'Chromatic' - You can see the new ZONE panels which have appeared, one for each sample opened; and the little cluster of ZONE ranges below the keyboard, one to each key (chromatic) for all the samples selected. 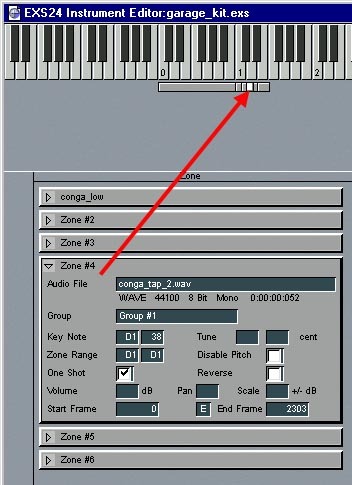 The ZONE panels which are created appear minimized... You can see I've selected one ZONE panel which is open; it's 'Zone Range' is set to one note, D1-D1 the same as it's KEY NOTE, (root key)... and that the ZONE RANGE bar has turned white below the keyboard indicating visually the position of the sample ZONE's range. All in all a great s/w; and all the more so in that it is included free with Logic. 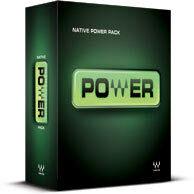 Combined with the also-included excellent ES1 synth, you get all you need to get great tracks going right out of the box!!... Let's see what Logic V5 brings us soon... if the EXS24 DOES become a VSTi compatible s/w then I can see it doing very well indeed with others beyond the Logic using fraternity... But as it stands now, it really puts Logic into perspective price-wise compared to the other s/w's in it's class... you're getting a $200 s/w sampler here for zilch, and it's all you need for any sampling needs and especially excellent for drums!!.... Great stuff, and of course with a decent ASIO or EASI driver-equipt sound multi-out device you can use EXS24 just as you would a hardware sampler, integrating it's outputs into your hardware outboard mix via the audio outputs on your PC or mac audio rack or breakout box!... Really, if you are a hardware user and have multi-outs on your PC/Mac box, then I don't think you need look to hardware at all unless you want really ridiculous levels of synthesis or live gigging hardware needs; this EXS24	does the job.. quicker & easier, with no grovelling round a small LCD screen or hopping thru endless menu's... Brilliant!! "The Emagic Xtreme Sample Player 24 is ideal for any musician who requires access to an extensive and ever-expanding sound library, but has no desire to deal with the sample recording process*. 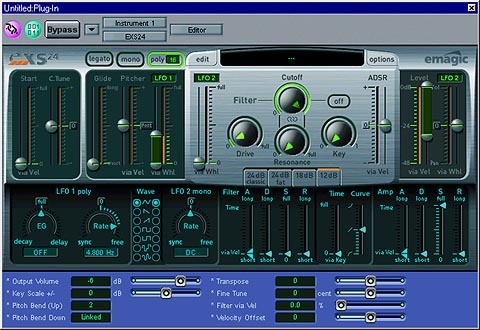 The EXSP 24, with its crystal-clear 32 Bit processing quality, gives direct, real-time control over these sounds to users of VST 2.0-compatible host programs. 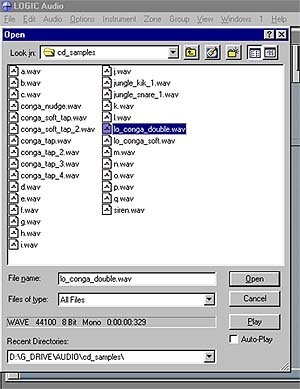 It reads both its native sample format and also SoundFont2 compliant samples - at resolutions of 8 to 24 Bit, and at sample rates ranging from 11 to 96 kHz. As all EXSP24 users receive over 500 MB of sounds from the world's finest Sample Instrument Library cost-free when they register, they can concentrate on the most important thing from the start: the music." 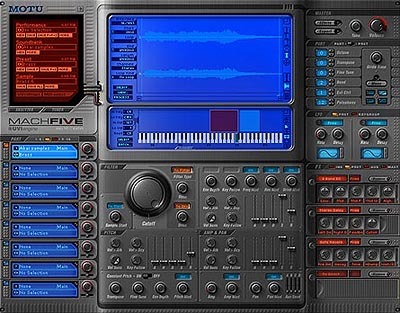 Well... you need Logic tho to actualy create instruments yourself, so it seems to be designed in terms of it's ASIO 2.0 ability for people who want s/w access to a huge library market. So the cheap price of £116.00 quid reflects that 'read only' VSTi status I think... It loads Akai S1000 & S3000 libraries. 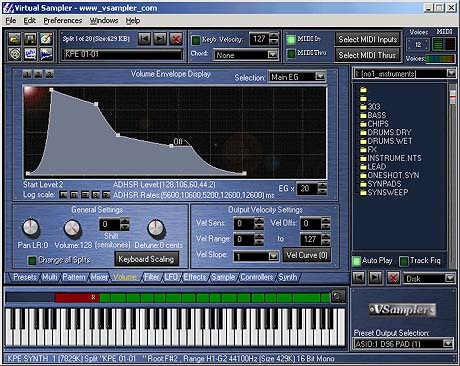 "The EXSP24 sample player runs on host applications capable of supporting VST 2.0 instruments. The EXSP24 can play samples ranging from 8 to 24 Bit depths, any sample rate from 11 to 96kHz, in any combination. As well as access to the ever-increasing EXS24 library, the ESXP24 also includes sample import facilities for SoundFont2 and Akai S1000/S3000*, across platforms. 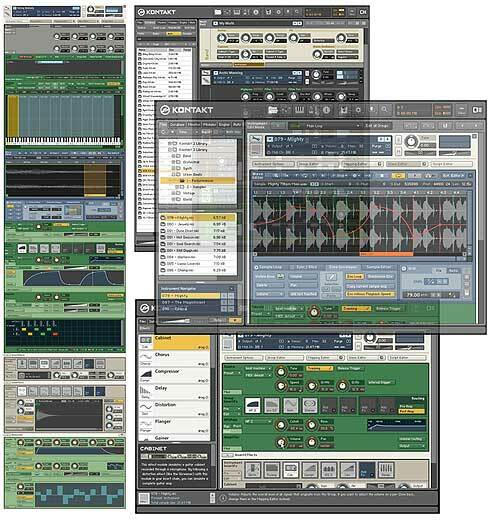 The EXSP24 comes with more than 500 MB high quality multi-samples of the most popular musical instruments. 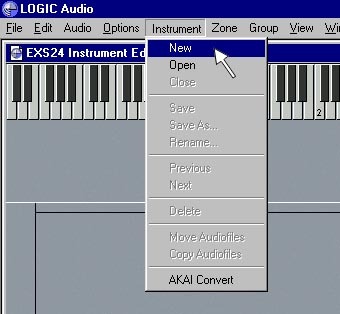 To edit samples and instruments, Logic Audio and an EXS24 are required. Owners of the EXSP 24 will receive an updater CD with extended functionality when they send the registration card to their national distributor. Really like this piece of software. BUT! It's not free... Someone should change that reveiw! The situation in the UK is also as noted above - I checked with Sound Technology, the distributors and EXS does NOT come with anyversion of logic audio. If you're thinking of getting it, it is very good, so look around s/h places first - I got mine for 145 UK (as opposed to 240 UK retail price) Its worth a little effort! it is the best thing i have seen. Totally awesome piece of kit. The ultimate original music writing tool. well, about the EXS24, I have Logic 5.1 in a not too legal version, just to check out of course, but I can't see how I should use it. 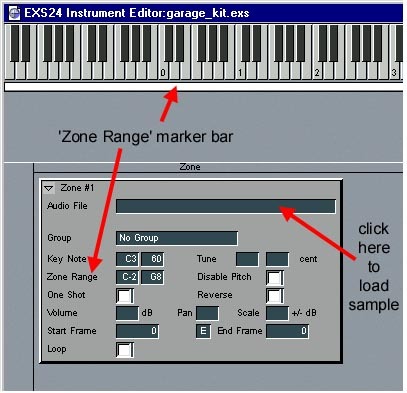 The zone/keymap window is active and I can make zones and so and add sounds but I do not succeed in calling them in an insert, the EXS24 is not available in my insertoption-menu. What am I missing ?? is it pos to have a demo sent to email add considering buying would like to try thank u for your time.